Sofitel Washington DC Lafayette Square is situated in a lively neighborhood with tree-lined streets and beautiful parks. The original site was once home to one of the most prestigious hotels in the area, and subsequently home to 17th United States President, Andrew Johnson (1865-1869), and 28th United States President, Woodrow Wilson (1913-1921). The building was originally designed by Mihran Mesrobian, who aimed to create a French-inspired oasis in historic Washington, DC. 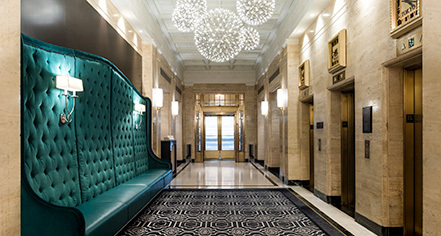 Similar to the White House, it prominently features columns in the lobby, coffered ceilings (a preference of former First Lady Jacqueline Kennedy Onassis), and Art Deco era limestone marble floors with a brass inlay. The building was purchased by AccorHotels in 1999 and opened in 2002. It underwent large scale renovations and restoration in 2014 and 2015. The hotel features luxury accommodations with distinctive style and incomparable service. All guestrooms come complete with complimentary WiFi, luxury bath amenities, and rain showers. Guests can expect fine dining on-site or eat in with 24-hour room service. Those seeking to hold an event can do so in one of the versatile meeting rooms or celebrate a glamorous wedding in the Paris Ballroom, complete with authentic French cuisine. No one has to miss a workout with the 24-hour fitness center and all business needs can be met in the business center. Due to the highly favored location, all who stay at the Sofitel can visit several nearby historic and cultural sites and attractions. Sofitel Washington DC Lafayette Square is listed in Travel + Leisure's The Top 10 Hotels in Washington, DC and is where classic meets contemporary in a one-of-a-kind urban getaway. This historic hotel remains an exemplary of opulence, while still reflecting the rich heritage of the area. The vast dimension, character, and grandiosity encourages guests to admire its beauty. 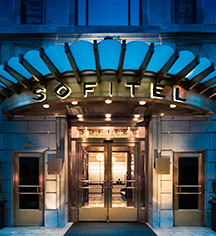 Sofitel Washington DC Lafayette Square, a member of Historic Hotels of America since 2018, dates back to 1925.